Many of our clients find that a hinged-door wardrobe is the perfect wardrobe solution for their home’s needs. Hinged-door wardrobes allow access to the entirety of your wardrobes storage space at once. Our design team will work with you to create your ideal design. At Profile Wardrobes, we pride ourselves on providing our clients with choice. Each of our hinged wardrobe solutions can be tailored to suit individual tastes requirements, ranging from traditional through to contemporary. Our talented trades team have the versatility to make any design you require out of the wardrobe door. 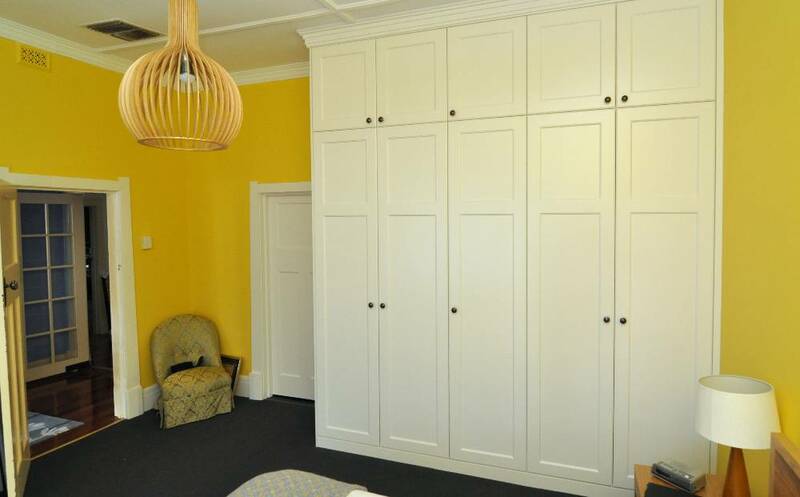 At Profile Wardrobes, we understand the importance of a high-quality finish which is why each of our projects are constructed from Australian made materials and completed by fully qualified tradespeople. From flat panel to patterned doors, your choice of finish in laminate, 2pak satin or gloss here at Profile Wardrobes we offer you individuality and total flexibility. Visit our showroom and a friendly design consultant will be happy to show you a selection of our range of hinged door wardrobe options or call us on 8234 6005 for further inquiries or to arrange an obligation free design consultation in your home.